The website contains a seamless amount of data and it is slightly difficult to manage each and every page or links over the period of time. Clicking a bad link or making typo errors is common mishap while surfing. If a user lands up in 404 error page on a site, it gives a bad feeling about a site. Instead, we can let him think in a positive way to proceed with his own corrections or to navigate to other site parts with a sorry message. 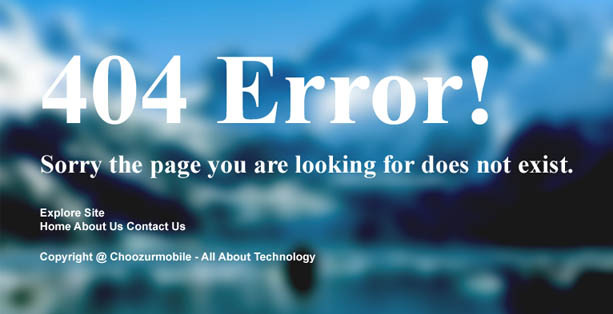 404 error pages usually give a bad impression about your website even with user's typo errors and online issues. It is not always the links on the sites go broken, but most of the time user input wrong keywords or click a wrong button on the site and reaches a 404 error page. Sometimes the third party links which you were earlier trusted may go offline after some time. It is always a good idea to tell the user that, "nothing much wrong about it, just proceed further and do not just leave away". Go to Settings > Click "Search Preferences"
Click on "Custom page not found"
Insert below codes in it. Note: Use your custom image link in above codes.